Flying Saucer Sighting in Dallas! Getting away from the Philly snow earlier this month I found myself in Dallas (for my paying job) and had the pleasure of being taken to the “Flying Saucer” – an amusing and rewarding destination for any Beer Appreciator. The Flying Saucer franchise of 14 cool beer-bars (alas currently located only in some mid south and mid west states) offer a truly HUGE selection of craft beers and unusual imports as well locals. 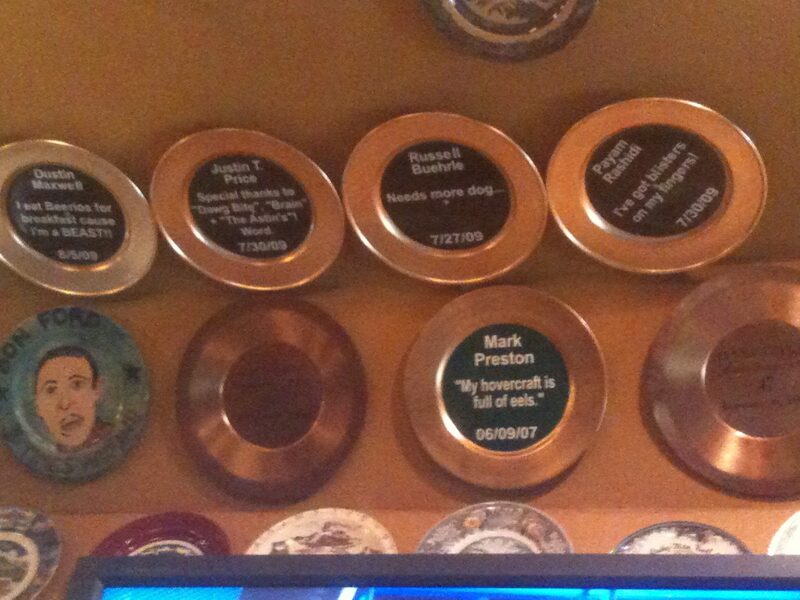 One of the things that sets them apart from others is their “U.F.O Club” – for which for the pleasure of quaffing 200 different beers over a twelve month period, you get into the “ring of fame” and get your own dedicated saucer nailed to the ceiling (or wall). This whole process is well thought out, as for a mere $18 you get a sort of credit card deal which you swipe at a special station when you buy your beers (and a T-Shirt). When you get to 200 you are a “Beerknurd” and into the ring of fame – with your own saucer with a pithy comment of your choosing. Of course you can get prizes, promos and the like during your journey, and if you are truly worthy – and go through this process more than once, your saucer color improves, as do your rewards. Five turns gets you a special “5er” MOU card, and if you do it ten times (and survive) you get a free airfare and tickets for two to the GABF in Denver. Talk about your perfect gift! So, I only had about 90 minutes – 200 beers seemed a bit out of reach, but I thought about it. How long would it take? As I chatted with my work associates, sipping on some notably hoppy Avery Hog Heaven Barley Wine, I did the math. OK, assuming one still has a marriage – or significant other, and a job that requires sobriety, lets say you get out three nights a week – and within reason average 3 high gravity beers a session. Assuming you don’t repeat a favorite brew (sure liked the local Austin Brewed 512 IPA) that would take you about 22 weeks – (less than 6 months!) to make it comfortably. Now, if that can be done in 6 months, is 400 in a year within reach? Do you get something extra for 2 “200’s” in one year? Uber-Beerknurd? A full place setting? Are there really 400 different beers available? The mind whirls! Anyway, if you find yourself in Texas, Tennessee or North Carolina and site a Flying Saucer – don’t be afraid, resistance is futile! 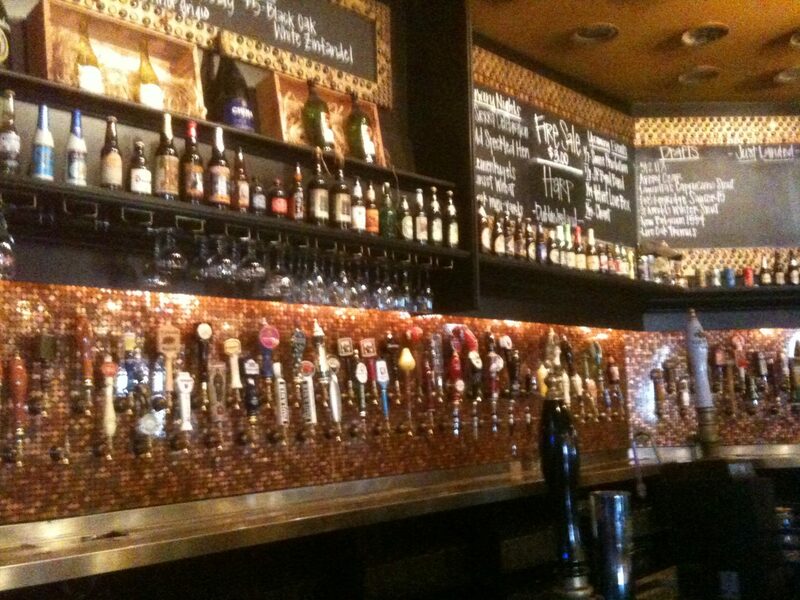 Taps a plenty for your 200 beer journey at the "Saucer"